Financial compliance depends on finance and legal. We select the best public reference ontology available for the domain. FIBO is a collaboration between the Enterprise Data Management Council (EDMC) and the Object Management Group. The EDMC leads design in collaboration with major Financial Institutions. OMG provides governance and publishes FIBO as a formal standard. The EDM Council is a 501(c)(6) non-profit trade association founded by the financial industry to elevate the practice of data management as a business and operational priority. The Council is a leading advocate for the development and implementation of data content standards and the publication of data management best practices. The Object Management Group® (OMG®) is an international, open membership, not-for-profit technology standards consortium, founded in 1989. OMG standards are driven by vendors, end-users, academic institutions and government agencies. OMG Task Forces develop enterprise integration standards for a wide range of technologies and an even wider range of industries. FIBO™ is a business conceptual ontology standard providing a description of the structure and contractual obligations of financial instruments, legal entities, market data and financial processes. The primary application of the business conceptual ontology is for data harmonization and for the unambiguous sharing of meaning across data repositories. This common language (or Rosetta stone) for the financial industry supports business process automation and facilitates risk analysis. Legal Knowledge Interchange Format (LKIF) models legal rules of the kind found in legislation and regulations. It is the main deliverable of the ESTRELLA project. LKIF is an Upper and Core ontology. The OWL files are available on GitHub. The European project for Standardized Transparent Representations to Extend Legal Accessibility (Estrella, IST-2004-027655) aims to develop and validate an open, standards-based platform allowing public administrations to develop and deploy comprehensive legal knowledge management solutions, without becoming dependent on proprietary products of particular vendors. While LKIF hold the financial laws and regulations, FIBO holds the business data. FRO aligns the two reference ontologies. Ontology alignment means that for each required entity (concept, relation, and instance) in LKIF we try to find a corresponding entity in FIBO. For Example, the FIBO Regulatory Agency in Figure 1 is equivalent to FRO’s LKIF extension of Regulatory Authority. There are 3 ontology levels based on their Level of abstraction shown in Figure 2. An upper ontology (aka top-level ontology or foundation ontology) is an ontology which describes very general concepts that are the same across all knowledge domains. Well known core ontologies are BFO, GFO, DOLCE, SUMO and Dublin Core. The goal of a core ontology is a global and extensible model into which data originating from distinct sources are mapped and integrated. (Doerr, Hunter, Lagoze) The core ontology applies to a specific domain, such as biology, medical, Legal and Finance. The Operational Ontology implements a core ontology. It is specific enough to hold source data. For example Hedge Fund Regulation Ontology is an operational ontology for the sub-domain of alternative investment management. FinRegOnt is a core ontology integrating legal and financial information. It is a standard practice and often mandated for Data Modelers at Financial Institutions to use Reference Models*. For a Semantic Web solution, integration with Industry Standards is even more important. Figure 3 shows the ontology imports for the Financial Regulation family of ontology publishing sites. 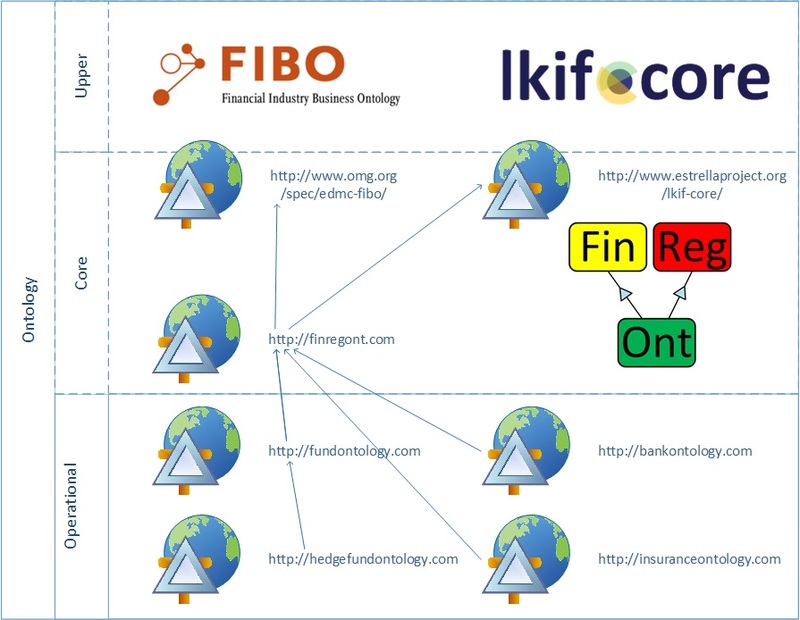 Financial Industry Business Ontology (FIBO). Legal Knowledge Interchange Format (LKIF). A core ontology for Legal domain. 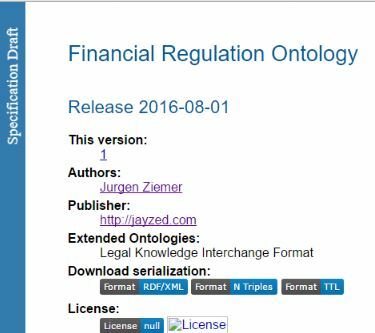 The consuming ontologies, Fund, Hedge Fund, Bank and Insurance Regulation Ontology just import FinRegOnt to have law and regulations as well as the aligned reference ontologies available. The statistics in Figure 4 show the number of elements in the two reference ontologies. Together we have over 900 classes to use and leverage. LKIF provides over 200 classes defining legal concepts. FIBO already has 700 finance classes and is still growing. There are no Data Properties and Named Individuals in LKIF. FIBO has some operational elements, data properties and individuals for Currencies, Countries and even the 12 Federal Reserve district banks. The OWL:Ontology bar shows the number of OWL files. 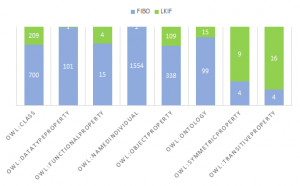 The high number of symmetric and transitive properties show the high ontological commitment in LKIF. Primitive layer consists of classes/properties forming taxonomic trees in which a single parent may be asserted. Complex layer refines the primitive layer by imposing restrictions such as necessary or necessary and sufficient conditions beyond the asserted subsumption. 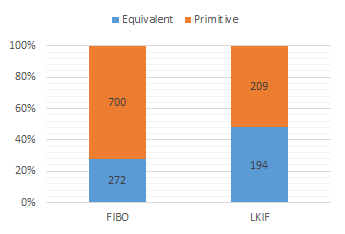 The ratio of Primitive to Equivalent classes in Figure 5 show that LKIF has larger Complex layer than FIBO. This fits the Financial Regulation Ontology purpose. We store financial data in FIBO and reason with LKIF rules.